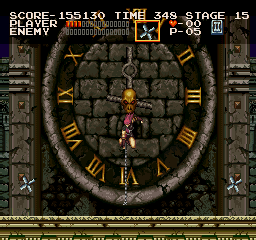 PSX Castlevania Chronicles (USA) in 26:28.38 by zggzdydp. In this run, the author uses Arrange Mode, as it's more suitable for taking damage to save time (Simon loses less HP when getting hit than in Original Mode). He also abuses a trick that allows him to use a subweapon with a shorter attack animation (jumping and whipping twice before attacking with the subweapon).